Your first assignment in biology is to read Chapter 1, Lesson 1 from the AGS Biology textbook. It is just a few pages, but the real assignment is taking Cornell Notes on what you read in your AVID binder. Here is a link to a page with an audio version of the AGS textbook so you can listen as you read if you like. Here is a link to a site about Cornell Notes in case you need a reminder of how to do them. Remember, the "Note Taking Area" on the right is where you write down ideas, vocabulary and examples from what you read. 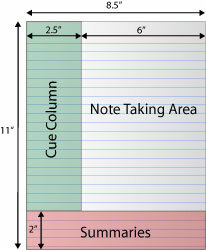 The "Cue Column" is for you to write main ideas and questions that relate to the material you have in your notes. When you are done you should write a 1-2 sentence summary of what you learned in the "Summaries" part on the bottom.